Today I am pursuing the course of my choice in a reputed university in Canada. But just a few months back I too was struggling with my Student visa. I was totally frustrated with my Student visa application had got refused. I was desperate to go and study in Canada. But the thought of having to start from scratch was annoying. That is when a friend recommended Kansas Overseas Careers. I am glad I decided to approach them as they actually got me out of the rut. The immigration consultants at this reputed company were very cooperative. They first told me the probable reasons due to which the visa applications of students get rejected. I am sharing here the details that they had given me. Studying in Canada can be expensive. So, the government wants you to prove that you have enough money to support yourself during your stay in Canada. Kansas Overseas Careers (KOC) told me how I can do this by way of scholarships etc. 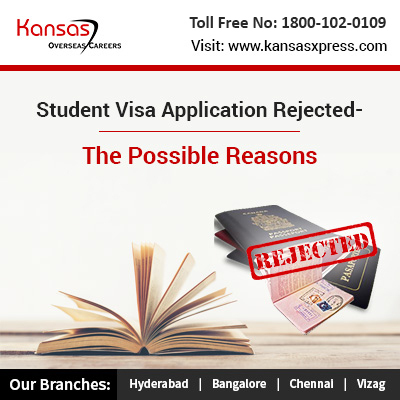 If you fail to convince the visa authorities that you will leave the country before your Canada study visa expires then too your Student visa may get refused. KOC advised me that I should make it clear to the authorities that I have enough reasons to come back to India once I complete my studies in Canada. Now here I was safe because I intended to pursue higher studies in accounting and I already had the basic accounting degree. But just for your information if you wish to pursue something totally new which is not related to your earlier degree, then you will have to give reasons for the same. You will have to convince the authorities. When one wants to Study abroad, there is a long trail of documents that need to be submitted. KOC told me that the most important document is the letter of acceptance from a Designated learning Institute. They also warned me to make sure that I do not get duped by fake universities and to get all the documents verified before submitting the same to the visa authorities. In case you submit false papers then there is no hope for you. The immigration consultants at KOC told me that visa application getting refused is a normal thing. They told me that I can appeal against the refusal. They also asked me to provide the notes that the case manager had attached along with the refusal letter. The Canada immigration consultants at KOC went through the notes and pointed out the errors that I had made. They asked me to resubmit the application. This time I avoided making any mistakes. KOC went through my application. They also checked all the documents and other details. Only once they gave me a green signal I resubmitted my application. My Student visa application was accepted and in few days I got my visa. Today I am pursuing my course in Canada. The entire credit goes to the efficient team of Kansas Overseas Careers. They showed me the way. So, if you too want to apply for any visa for Canada then I would strongly recommend this reputed visa and immigration consultancy company.